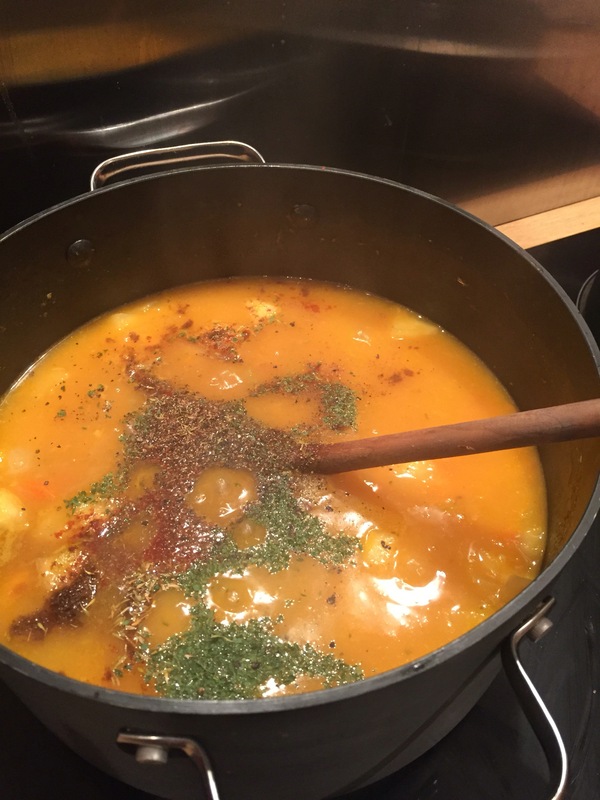 If you eat soup every week of winter, like I do, it can get difficult to come up with new ideas as to how to make them all different. 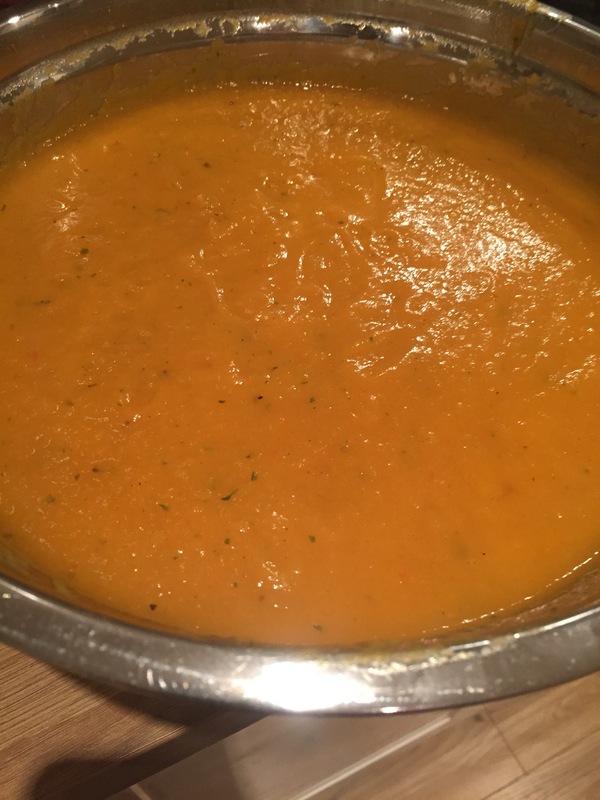 Charles doesn’t believe in sweet potato soup because he reckons it’s too carb-based to be a light vegetable soup, but I reckon it’s ok every now and again, as it still counts as one of your 5-a-day, and it’s diluted by other vegetables and stock. 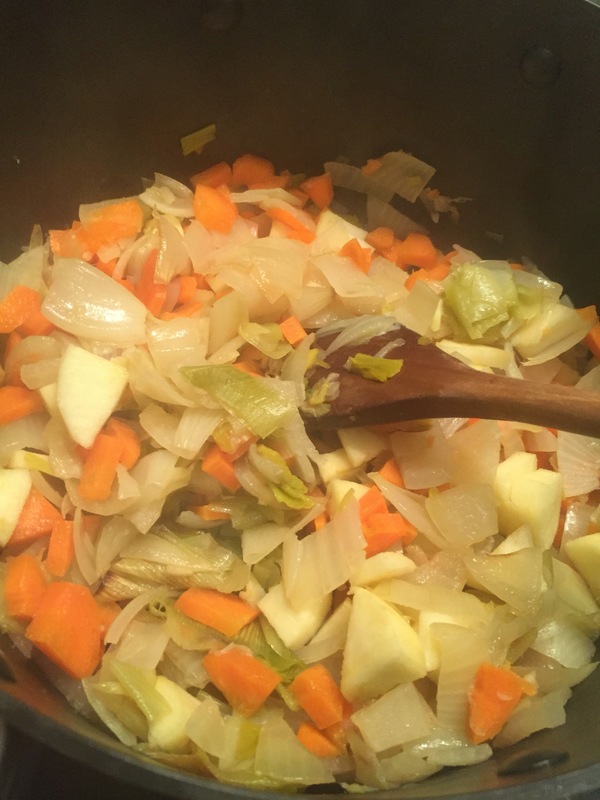 It is quite hard to get flavour into root vegetable soups, but I always find that roasting the vegetables first can intensify the flavour of the various vegetables. 1. Get your oven heated to 180c fan. Cover two large baking trays in tin foil. 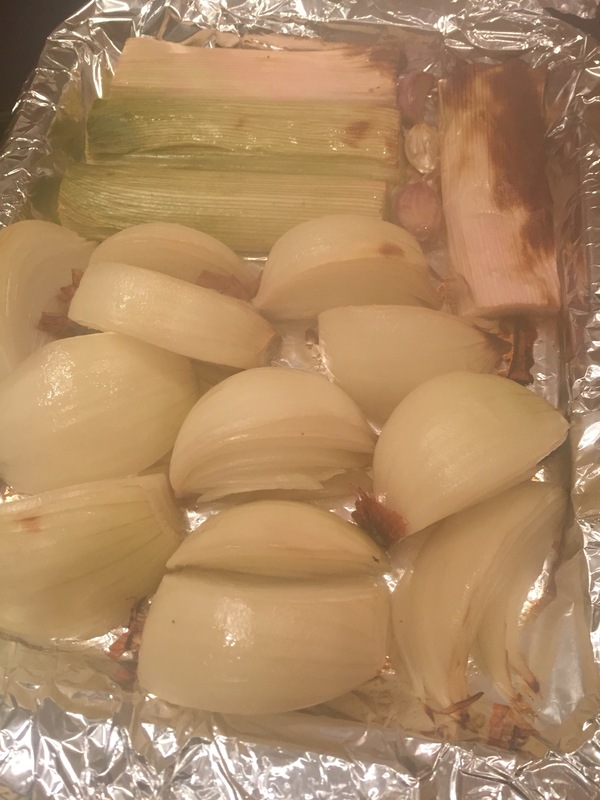 Cut the onions and leeks into large chunks and place on one of the trays along with the garlic (still in its skin). Splash on some oil, cover with tin foil to avoid crispy bits and shove in the oven. I left the tougher outer layers I usually remove on the vegetables to protect the inside of the veg from too much heat. 2. 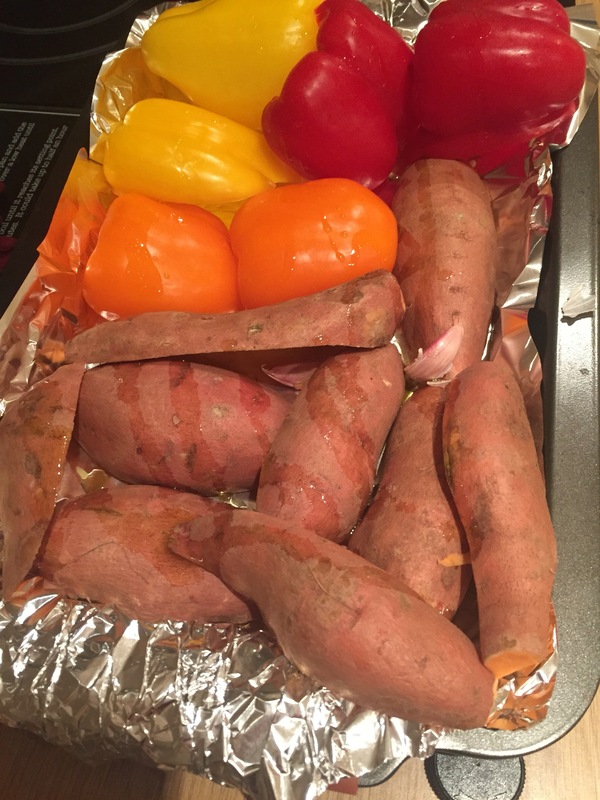 Repeat with the sweet potatoes and peppers and the second tray, putting the flesh down and skin up, topping and tailing the sweet potatoes and removing the seeds and stalk from the peppers. Shove in the oven uncovered so the skins with catch and be easy to remove. Roast both trays for around half an hour. 3. 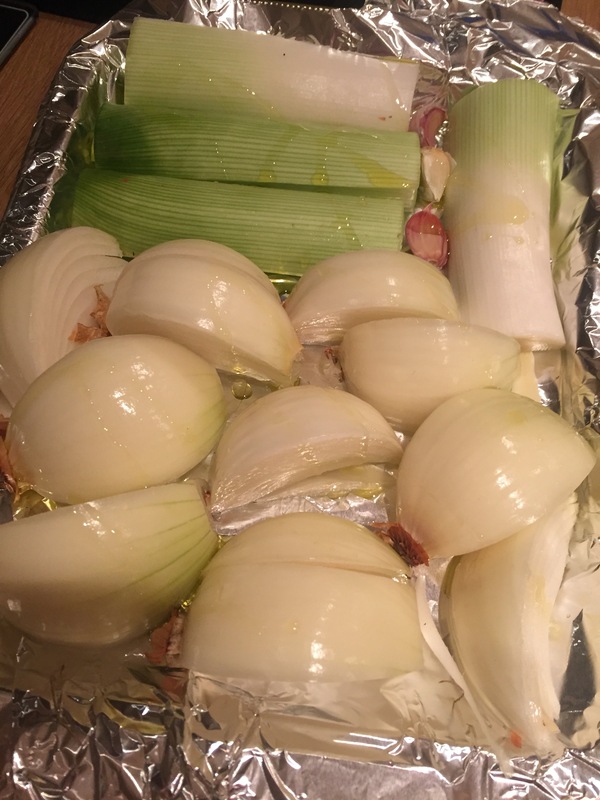 When the onions and lens have largely softened and started to brown, remove from the oven. Allow to cool until you can comfortably touch them, then remove the outer layers and stalks and chop into relatively small pieces. 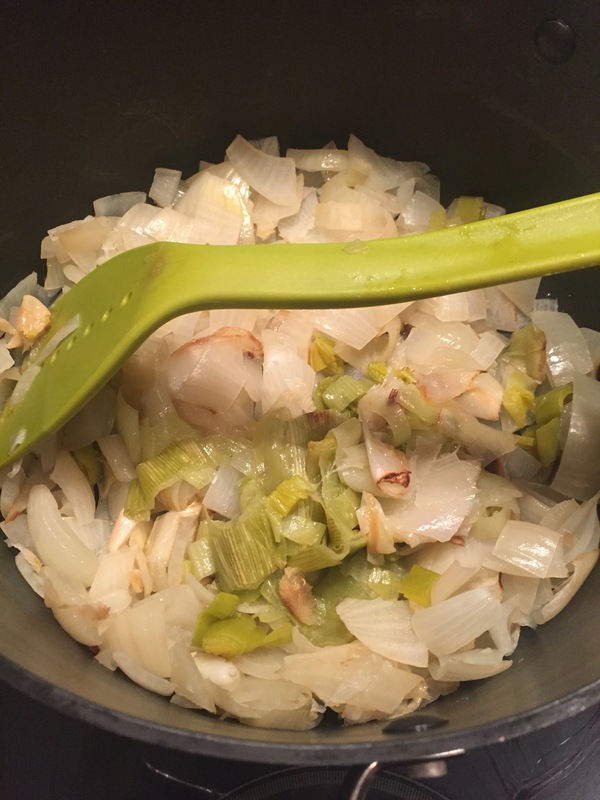 Add some oil to a soup pot and set it on a medium to high heat then add in the onions and leeks to continue to sweat down. Squeeze the garlic out of its skin. 4. 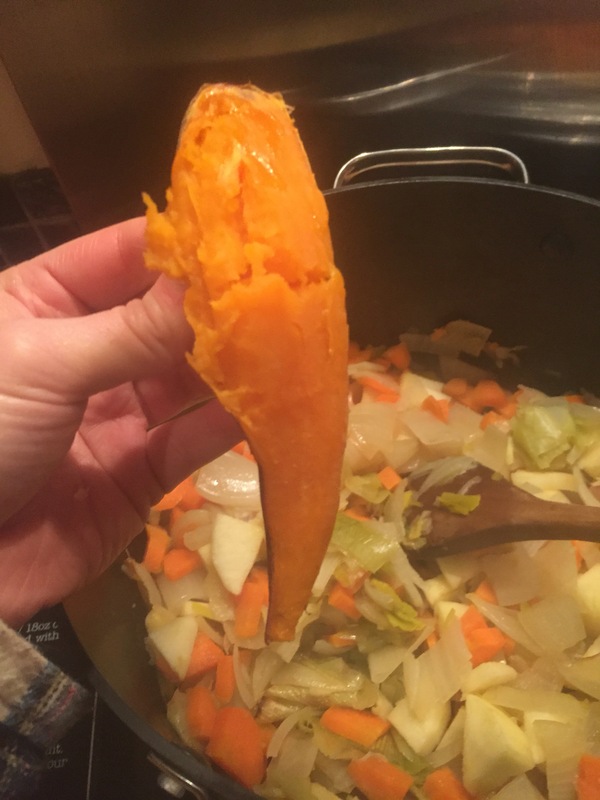 Meanwhile, peel and chop the carrots and apple and add to the pot. 5. Allow to cool down for 10 minutes or so while you deal with the rest of the veg. 6. 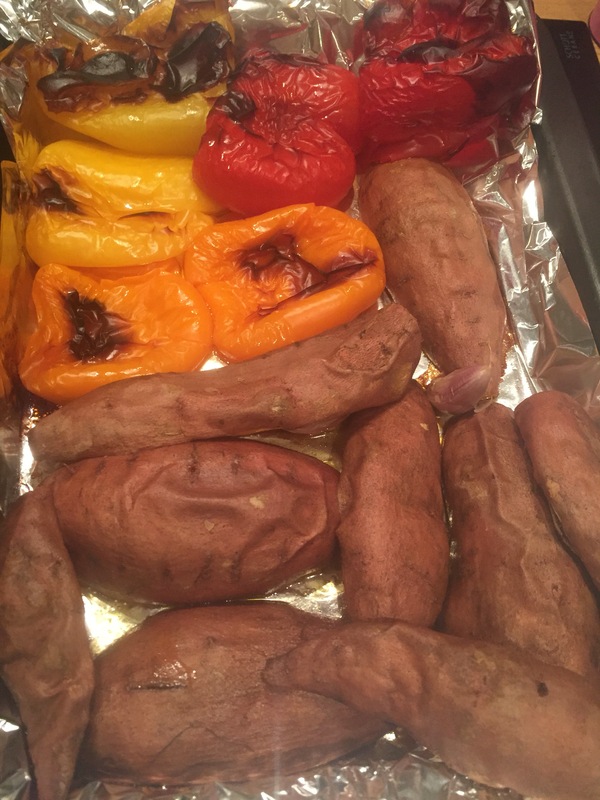 Pull the peppers and sweet potatoes out of the oven. If they’re ready, the skin will be darker and wrinkly. 7. Pinch the skins and pull them away from the flesh. 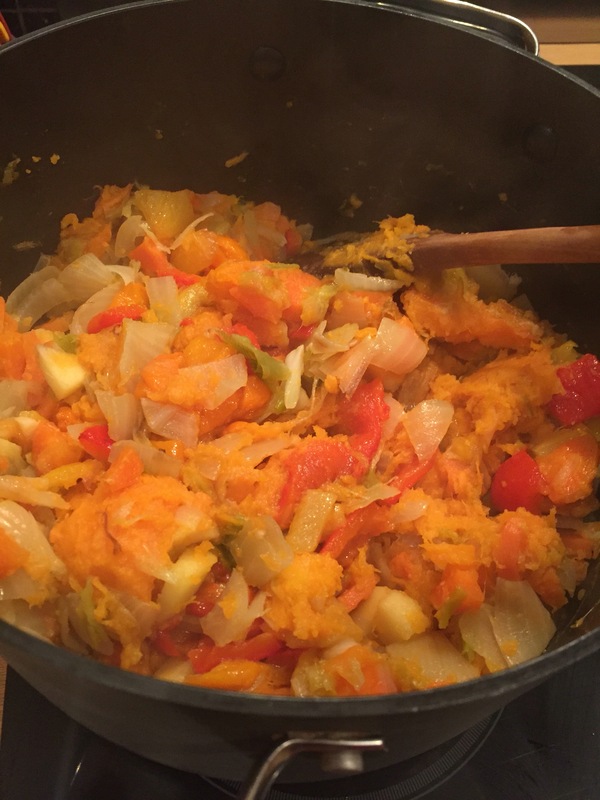 The sweet potatoes will be baked, like solid mash, so they can just be added to the pot and broken up with a spoon. 8. 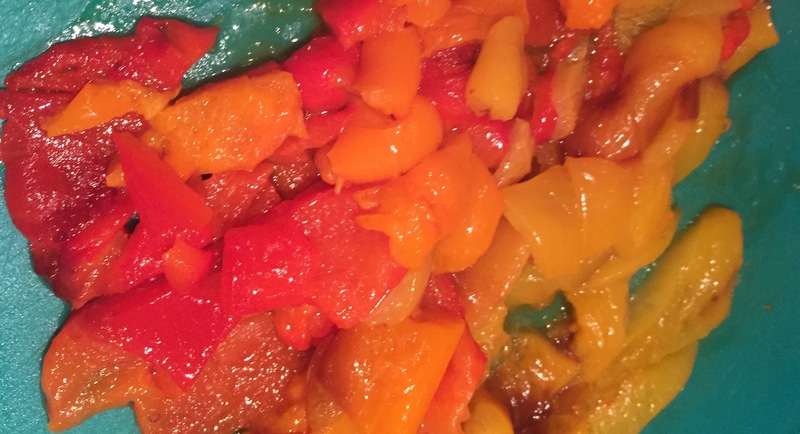 Repeat with the peppers (the skin should be papery and peel away easily)but chop them up before adding to the pot. 9. Prepare and and the stock then put the lid on and allow to simmer for 40 minutes or so. 10. Add the spices etc, then finally, blitz with a stick blender or liquidiser. I always decant it into another bowl to avoid scratching my soup pot with the stick blender. 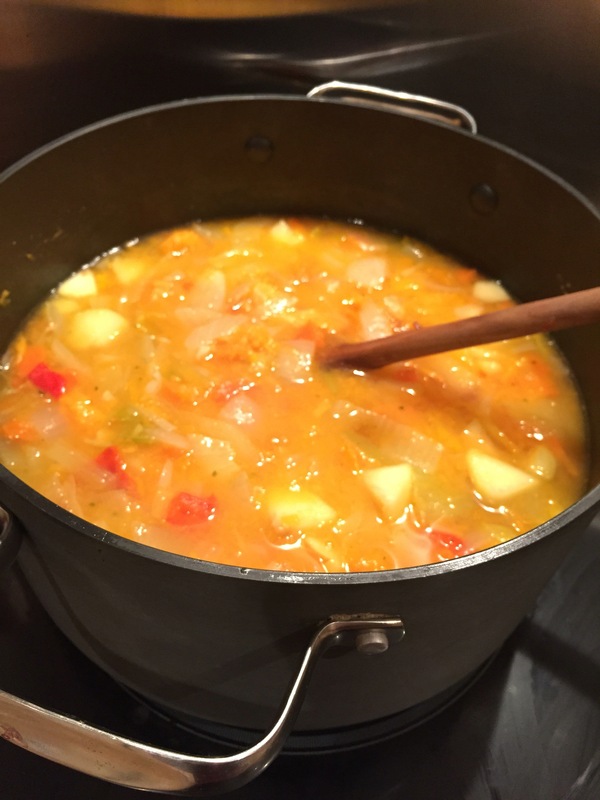 If the consistency is too thick at any point, just add a little more water or stock. Enjoy for lunch all week and freeze what you won’t use! Enjoy!